How to prevent the "dented look", see picture top right where just about every screw left a dent. 1. After all the holes have been drilled, remove the plate and clean up any burrs or raised wood particles left by the drill bit. If this is not done particles trapped behind the plate will prevent it from laying flat against the door. 2. Do not over tighten the screws which is easily done! Stop as soon as the screw head touches the kick plate. 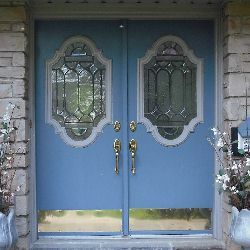 Installing a kick plate is one of the fastest ways to spruce up your front door. They come in a few different finishes to complement the other door hardware. What is is door kick plate? A kick plate is a metal plate fastened to the bottom of your front door. The height of the kick plate depends on the size of your door but the standard height is 6 inches (15cm). For larger doors you may want to install an eight inch (20 cm) kick plate. Brass, aluminum and stainless steel are the choice materials used. The kick plate finish should match the other door hardware. When I went out to take pictures of kick plates I found that the majority of kick plates had a polished brass or antique brass finish. Kick plates are magnetic or are mounted with screws or adhesives. Adhesives leave a sticky residue. Magnetic kick plates can be installed quick and easy but only work on steel entry doors. What is the purpose of a door kick plate? 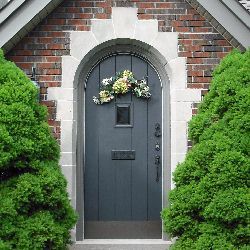 I think the main reason for installing a kick plate is to improve the curb appeal of your home. Some sources claim that the plate will protect the door finish from scuff marks or toe kicks, and it will do that, but I wonder why anyone would want to kick a nice front door in the first place. So, in short, door kick plates are installed for ecstatic reasons only. - With the door in open position measure the width of the door. - The length of the kick plate should be approximately two inches (50 mm) less than the width of the door. The one inch (25 mm) space on each side is needed to stay clear from weatherstripping. - Custom size kick plated are readily available for over sized doors. - Close the door, and using some tape, position the kick plate in the center of the door and approximately a half inch (12 mm) above the bottom of the door. - If screws are used for mounting drill two holes in the door, one on each end, through the pre-drilled holes of the kick plate. - Fasten the plate with the two screws and check if the kick plate is level. If it is, drill all other holes. - Once all the screws are installed remove the clear protective factory installed shipping film.